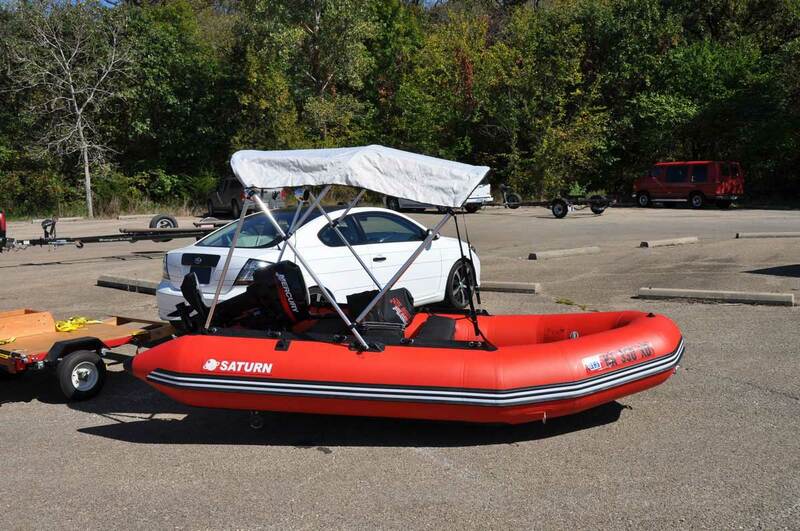 I have a question – I want an inflatable boat. Double. Which is better – rubber or PVC? Who has the experience of owning a boat – Prompt model. The big water (big river for example) – only PVC – only multi-layer PVC – the choice is huge! Nothing about rubber do not want to hear! PVC is much more reliable – the pressure keeps great, then the sun will not break.. . No sense to compare (all this applies only to normal PVC,not to one-layer PVC !!!). For $1100 – $1300 CA you can buy a really good boat. Of course you can buy a used one. But the motor I would have taken a new. When selecting a boat – you sould to know that it seems big only in the store – on the water it is always less than and you always want more space, and evaluate the weight of the boat with their abilities. For me the maximum set, which can load and assemble (well, to be launched) normal man alone without hemorrhoid in full and in a figurative sense – the boat of 3.5-3.6 meters and motor 9,8 hp if more one-on-water – you probably ok 3.2 meters and the motor 4 or 6 hp. Storage PVC boat unpretentious – even if it never wash will last a long time – and with proper care from friends already on me years not less walk… When buying a boat would be nice to make “sleeves” from inside in order to put the spinning rods and rods, freeing hands at fishing and relocation… . I was glad to share.